INJURED IN A SLIP AND FALL? In a perfect world, no one would ever get hurt on the job; unfortunately, we do not live in a perfect world. Here at Goodman Elbassiouni LLP– specializing in personal injury cases in the GTA – we wish that everyone was always compensated fairly when they suffered a workplace injury. Although the WSIB does a pretty good job of assessing workplace injuries on a case by case basis, they are a human organization and thus, prone to human error. Workplace injuries range from things as serious as spinal cord and brain injuries from falling off of scaffolding or being struck by a heavy, falling item, to subtle injuries such as repetitive strain injuries (RSI), heatstroke or respiratory issues from inhaling industrial chemicals or fumes. While managers and bosses will sometimes tell you that a little discomfort is no big deal, don’t listen to them. Always keep notes and report even the subtlest symptoms to your doctor. Being a team player and looking out for your own well-being (and the well-being of your family) are not mutually exclusive endeavours. If you suffer a work related injury, always report it the WSIB immediately. Additionally, it is your manager’s responsibility to report employee’s injuries to the WSIB. Between forklifts, nail guns, cranes and jackhammers, there’s a lot that can go wrong. Responsible construction companies will provide some sort of work safety training, whether they do it in house or outsource it to a course run by the government. Beyond knowing how to use equipment properly, workers should also understand that equipment itself doesn’t always work properly. Heavy, industrial equipment should be serviced once in a while and inspected every time that it’s used. Encourage others to follow best practices to avoid unnecessary workplace injuries. Sometimes malfunctioning equipment can result in product liability – where the manufacturer is partially to blame for the accident. These kinds of accidents are usually the result of neglect on the part of the supervisor or manager on duty. Any use of a motor vehicle should be accompanied by a spotter to make sure that nobody ends up in harms way. On a noisy construction site, it can be difficult to hear a vehicle approaching at times, especially if you’re wearing protective gear on your head or over your ears. These cases can be tricky depending on who is driving the vehicle, and often a good deal of rehabilitation is required. Even after a long path to recovery, sometimes right to work disputes can arise, which prolongs the period of suffering, anger and blame. Often a foreman or supervisor will encourage crews to “push-through” or “man-up”, but this type of macho bullying is out dated. Studies have proven that a well rested crew works better, so pushing yourself for one day will ultimately not make the job go faster in the long run. At worst, it will make for sloppy work and a higher rate of injuries, especially if it’s hot outside. 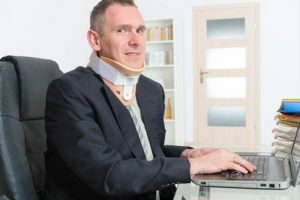 If you need reputable slip and fall lawyers on your side or if you are injured at work or in an automobile accident, Goodman Elbassiouni LLP is here for you. Call us today for a free consultation! At Goodman Elbassiouni LLP, our lawyers are available to speak with you at no cost regarding your case. We get back to all client inquiries within 24 hours and treat everyone like a priority. Whether you are injured at work, in a motor vehicle accident or a slip and fall accident – we are here to help. Don’t delay any further and call us now. Goodman Elbassiouni LLP specializes in WSIB claims, slip and fall claims and claims stemming from motor vehicle accidents all across Ontario. If you or a loved one have been injured, contact our offices today for a FREE initial consultation and a member of our legal team will speak with you directly. Remember there are time limits on claims in Ontario – so the sooner you act, the more likely your rights will be protected. Contact us today for a free consultation.